Most newspapers and main stream media sites often add customized quotation blocks in their articles. Why? Well because quotes are probably the most memorable and shared part of the article. Quotes have a potential to go viral. Recently we showed you 9 different design examples that you can use to customize blockquote in WordPress. In this article, we will show you how to allow users to share quotes from your WordPress posts to Facebook and Twitter. First thing you need to do is install and activate the RealTidBits PushQuote plugin. After activating the plugin, go to the post editor by clicking Posts » Add New. If you are using the visual editor, then you will see a pull quote button among other icons in the post editor. Select the lines in your post content that you want to display as a pullquote and press the pullquote button on the editor. It will ask you whether you want to align it to the left or right, and you will be done. [pullquote]Text from your article to be used as pullquote goes here[/pullquote]. RealTidBits PushQuote plugin uses tidbit.es for URL Shortening. We wish there were an option for users to change it. However, you can still change the way plugin looks by editing the stylesheet located in CSS folder. You can use an FTP program to edit the file pullquote.css located in /wp-content/plugins/pushquote/css/. You can also edit the stylesheet from your WordPress admin panel. Go to Plugins » Editor and use the drop down menu to select Pushquote Plugin. On your right hand you will see a list of files, click on pullquote.css file to edit it. Quotation blocks are used to catch user’s attention by highlighting the most interesting bits from the article. This is what makes them memorable and the most shareable. 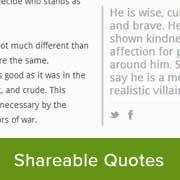 We hope this article helped you add sharing buttons to your quotation blocks in WordPress. Would you be using this on your site? Let us know by leaving a comment below. Thanks for reporting this. We tested the plugin and it seems to have stopped working. We will try to find an alternate solution. Meanwhile, please take a look at this guide on how to add click to tweet boxes in WordPress. Hi there! Any idea why this plugin might not be working with my blog? I’ve tried a couple of different themes and I’ve tried deactivating all other plugins to see if it might be fighting with another one. No luck. 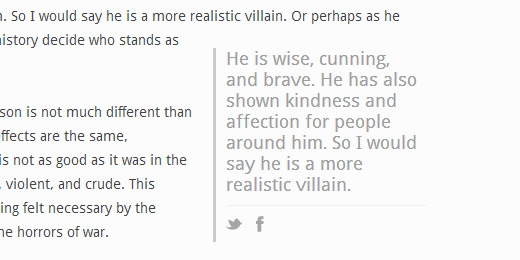 I LOVE the way this one looks so streamlined and doesn’t take away from the rest of the post. The only alternative I’ve found is text to share, and the buttons are large and obnoxious. Any help would be greatly appreciated!! now you can close your eyes and do it easily with css3 and a shortcode. ups,, it’s too late for me. i read this article on january 2015. This looks great but the plugin hasn’t been updated in over a year. I’m hesitant to use it, because of this. Do you know of another similar plugin that is current? Or could this be manually added without a plugin? I am very new to all of this, I want to thank you for the info and also ask is there a plugin that we can use on a general collection of quotes not just pull quotes…. Like if I have 50 love quotes what plugin do I need to allow people to share the quote/s they like and/or rate each love quote as well? I must also agree. You’re doing a fine job with the plugin recommendations and guides. I plan to try out many of your favorites. Thanks. This site has been a Godsend to my blog! Thank you! Thank you for the kind words Fran Glad we are able to help. All the author has to do is resist the temptation to stick in a pullquote where she/hethinks there is particularly “foine wroitin'” to be repeated. Personally, I would let a friend be the judge as to what is the pullquote. If any. But really, thanks. It lifts the professional look of the blog.